"Manny being Manny" — the simple phrase seemed to instinctively capture the essence of his baseball persona. He was one of the greatest right-handed hitters of the past 50 years. As of 2015, he ranked ninth all-time in career slugging percentage (.5854), has 555 major-league home runs (placing him number 14 — and he's got another 29 postseason home runs — more than any other player), and is number 32 in career on-base percentage (.4106). He won the American League batting crown in 2002 and was World Series MVP for the Boston Red Sox in 2004. He's a 12-time All-Star, with nine Silver Slugger awards, and he's third all-time in grand slams. Ramirez was also beloved by fans entranced by his hitting and his charisma at the three main stops on his career route — Cleveland, Boston, and Los Angeles. Each time, he burned bridges behind him, leaving fans disappointed, or worse, though one wouldn't know that from the statistical record alone. Named after his father (and a statesman of ancient Athens) as Manuel Aristides Ramirez, he was born on May 30, 1972, in Santo Domingo. His high school, though, was George Washington High School in New York City. An outfielder throughout his career, he was a first-round pick of the Cleveland Indians (the 13th pick overall) in the 1991 draft. Manny's lack of English-language skills left him unsure of himself in situations where conversation was called for, but his work ethic showed from an early age in punishing workouts, waking as early at 5 A.M. on a regular basis to get in his running — and quite often running up hills in the city, tugging a 20-pound tire behind him secured by a rope around his waist. 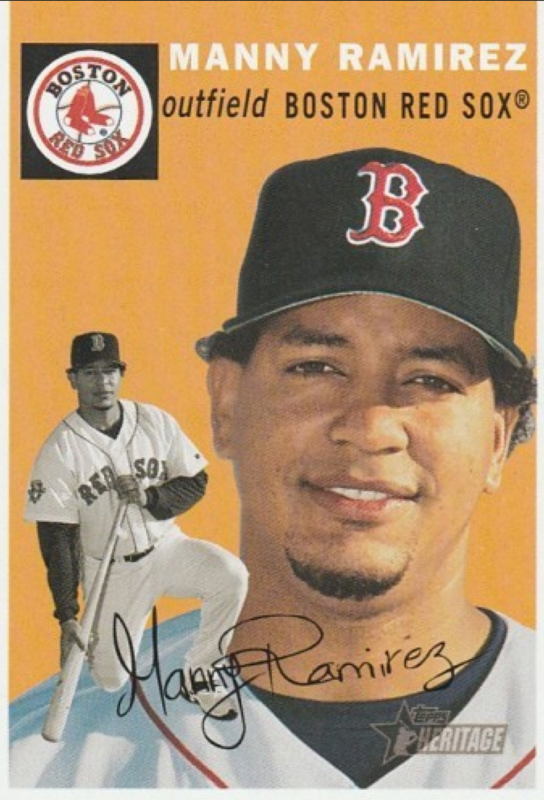 Even years later, teammates on, say, the Boston Red Sox, mentioned that no one worked harder in the weight room and with training than Manny Ramirez. Under the baggy uniforms was a sculpted body that might have been featured in a fitness magazine; as a major leaguer, he was listed as an even 6 feet tall and 225 pounds. Once on the Washington High team under coach Steve Mandl, Manny truly excelled. As early as age 17, he made the first of two trips to New Mexico with the Youth Service League to play in the Connie Mack World Series.7 He hit for a .630 batting average in his junior year and was named to the All-City team. In his senior year, he surpassed that, batting .650. He was named New York City Player of the Year. Needless to say, scouts began to pay attention — even if it meant making the trip into neighborhoods one could understatedly deem dodgy. Cleveland Indians scout Joe DeLucca followed Ramirez carefully, but also at a bit of a distance so the other scouts wouldn't see how interested he was. He wanted to make Manny a first-round pick, but there were 12 other teams picking first. Indians scout George Lauzerique told DeLucca, "No Latin-American immigrant kid has even been drafted in the first round," but that didn't faze DeLucca, who stuck to his guns.8 The Indians selected Ramirez in the June 1991 draft, and signed him with a $250,000 bonus. The Indians had Ramirez attend a two-week minicamp and then go to Burlington, North Carolina, for rookie ball in the Appalachian League. He did well — hitting .326 with 19 homers and more than one RBI a game — 63 RBIs in 59 games. Ramirez’s 1992 season was a tougher one. The Indians asked him to play winter ball in the Dominican Republic, but he quit after 15 days and returned to New York. Playing for the Kinston Indians, in the high Class-A Carolina League, he got off to a very slow start, but he started to hit in June and the beginning of July — when he broke the hamate bone in his left hand, costing him the rest of the season. He hit just .278 in 81 games. In 1993 Ramirez was assigned to the Canton-Akron Indians (Double-A Eastern League), got into 89 games (.340, 17 HR, 79 RBIs) and got himself called up to Triple-A, to the Charlotte Knights (International League). He played in another 40 games and drove in 36 runs, with a .317 average — and also got himself called up to the major leagues, to Cleveland. He was later named Baseball America's Minor League Player of the Year. When he got the call, Ramirez asked Charlotte manager Charlie Manuel, "Can you come with me? "9 The sentiment was emblematic of his attachment to certain mentors along the way. Needless to say, Manuel couldn't drop everything — he had the Knights on the way to the league pennant. Ramirez joined the Indians in Minneapolis on September 2 and was 0-for-4, though three of the balls were well-hit fly balls. The very next day, they played at Yankee Stadium, with lots of Manny's family and friends at the game. He hit a ground-rule double to left field his first time up, flied out in the fourth, hit a two-run homer to left in the sixth off Melido Perez, and then hit another one — also to left — off Paul Gibson. Two homers, three RBIs, and a 7-3 Cleveland victory. It was quite a splash but Ramirez struggled from that point on, getting only six more hits in 45 at-bats, with two more runs batted in and no more extra-base hits of any kind. With one exception, he DH'd, and pinch-hit in four games — and, perhaps a little oddly, pinch-ran in five. He ended the season, after appearing in 22 games, batting .170. The 1994 season ended with a players' strike. The Indians played 113 games, and Ramirez appeared in 91 of them. It was his official rookie year, and he came in second in Rookie of the Year voting, though compared to the rest of his stats, it was one of his least productive years. He did drive in 60 runs. The Indians opened the 1995 season in Texas. The team went on to Detroit, and after they left, there was a typical Manny moment — he'd left his paycheck in a boot underneath his locker. It had to be shipped onward to him. Ramirez himself hit 11 homers in just the month of May. (He was named AL Player of the Month.) He made the All-Star team for the first time, drove in 107 runs (helped by 31 homers), and helped the Indians reach the World Series. He hit only .222 in the Series itself (with a .364 on-base percentage), with one homer, but there was only one Indian who hit higher — Albert Belle with .235. The Cleveland offense was clearly lacking — 19 runs in six games, losing to the Atlanta Braves. Ramirez's early career was replete with a number of fielding and baserunning lapses. He was cut slack, of course, given his hitting — in 1996 he drove in 112 runs, with 33 homers. He hit for a higher average in 1997 (.328) but his RBIs declined to 88. Matt Williams, Jim Thome, and David Justice each drove in just over 100. The Indians made the postseason again, and went all the way to the World Series once more, playing the Florida Marlins. At one point or another, the Indians held a lead in each of the seven games, but in the end they lost four. Ramirez contributed some key hits in the first couple of rounds, but was 4-for-26 (.154) in the World Series. Average alone was deceptive; he drove in six runs in the seven games. Occasional lapses aside, Ramirez had a strong and accurate arm. Twice he led the AL in assists from his position: 1996 as a right-fielder, with 19, and in 2005 as a left-fielder, with 17. With 45 homers and 145 RBIs in 1998, Ramirez had an exceptionally productive season, despite a batting average six points under .300. At one point in September, he homered in four at-bats in a row and eight times in a five-game stretch. It was the second year he made the All-Star team, and the first year in what became a string of 11 consecutive annual All-Star selections. The Indians beat Boston in the ALDS but lost to the Yankees in the ALCS. Ramirez hit two homers in each round, batting .357 and .333 respectively. There were thoughts, though, that Ramirez’s fielding may have cost the Indians the chance to get to another World Series. It was Game Six, at Yankee Stadium, and the Indians had just scored five runs in the top of the fifth to pull to within a run of New York. (Thome hit a grand slam, but Ramirez had struck out with the bases loaded.) In the bottom of the sixth, Derek Jeter tripled to right field to drive in two big insurance runs — but the ball was a catchable one. A New York Times article was headlined: "Ramirez: Big Bat, Blunders." Ramirez had leapt to catch the ball, only to have it land at his feet. He wasn't charged with an error, but he had clearly erred in anticipating the ball's trajectory. The year 2000 was Manny’s contract year in Cleveland and he got off to a great start, but he was on the disabled list with a serious hamstring injury from May 29 to July 13, missing 39 games. Despite missing a quarter of the season, he still had 122 RBIs and 38 homers. He hit .351 and led the league in slugging (.697) and OPS (1.154). There was no doubt Ramirez was due for a big contract. Red Sox GM Dan Duquette won the bidding war. 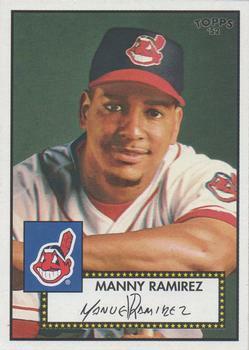 Ramirez was a huge fan favorite in Cleveland and the Indians kept upping their offer, but he signed with the Red Sox for a reported $160 million/eight-year deal.12 Manny had one final condition before signing: that the Red Sox hire Cleveland clubhouse man Frank Mancini, to accompany him to Boston.13 It was reminiscent of him wanting Charlie Manuel to come with him from Charlotte. It also didn't happen. Some wondered if Ramirez could handle the intensity of the Boston market. Rhodes and Boburg quoted Macaco as saying that "Manny's lack of anonymity at shopping malls was one of his primary dissatisfactions with life in Boston." Bizarre as that may seem, "Manny always wants to go to shopping malls. Sometimes we'll go two or three times a day." And it wasn't necessarily to buy anything.14 He just liked going to malls, but quite naturally didn't want to be relentlessly fawned over and followed by fans. Ramirez was the Red Sox DH into June, when he began to play left field. In late August he reverted to DH. (He was DH for 87 games and left fielder for 55.) He had a career high in strikeouts, with 147, but still achieved a .405 on-base percentage (hitting .306), and drove in 125 runs, 37 more than anyone else on the Red Sox. He had 41 homers, 14 more than Trot Nixon's second-place 27. Ramirez lost more than a full month in 2002 due to a broken left index finger, fractured on a head-first slide into home plate on May 11 (he was out), and not returning until June 25. In 120 games, he drove in 107 runs, with 33 homers. His .349 average (.450 OBP) won the American League batting title. It was back to the playoffs in 2003, the first full year under new ownership. Ramirez played in a career-high 154 games, and led the league in on-base percentage (.427). He hit .325, just one point behind the AL batting champion, teammate Bill Mueller. He hit 37 homers, drove in 104 runs (one behind teammate Nomar Garciaparra), and scored 117 runs. Too often, there seemed to be a discordant note. In late August the Yankees came to Boston for what was really a key series. Manny was excused from the game due to throat inflammation — but was discovered in the Ritz-Carlton bar with Enrique Wilson of the Yankees, which didn't go over well with the Red Sox fan base. Neither Ramirez nor David Ortiz hit that well in the Division Series, but the team pulled through and Manny's three-run homer in Game Five made all the difference in the 4-3 win. Ramirez homered twice and drove in four runs in the ALCS against the Yankees, a series that went to seven games and seemed to be in Boston's hands until manager Grady Little (who'd been the bench coach on the Indians in Manny's last years there) put Pedro Martinez back into the game when he seemed so obviously out of gas. The Yankees rallied and tied the game, then won it on Aaron Boone's home run leading off the bottom of the 11th. Little was fired, and Terry Francona hired as manager for 2004. Ramirez had more than once expressed a wish to get out of Boston. At the end of October the Red Sox placed him on waivers — they could have called him back if any team had claimed him, but none did. There was, after all, close to $100 million remaining on his contract. Perhaps the Red Sox did it just to make a point with Manny about what a good deal he had — so good no other team was willing to pay the freight to get him. There was also discussion about trading Ramirez, as part of two trades that would have brought Alex Rodriguez from the Rangers for Manny and Jon Lester, and sent Garciaparra to the White Sox for Magglio Ordonez. A-Rod wanted to come to Boston and was willing to take a $25 million pay cut to do so, but the Players Association refused to sign off on such a hefty cut. Manny Ramirez was World Series MVP in 2004, the Red Sox this time rolling over Anaheim in the Division Series (he had seven RBIs in three games) and then losing the first three games of the ALCS to the Yankees, only to come back and win an unprecedented final four in a row. Oddly, Ramirez didn't have even one RBI in the ALCS, though he hit .300 and scored three times. Facing the St. Louis Cardinals in the World Series, Ramirez looked like a stumblebum in left field, committing two errors in Game One. He overran a ball in the top of the eighth, allowing one run to score, and then made an awkward slide to try to catch a ball on the very next play, letting it get past him as another run — the tying run — scored, costing the Red Sox the lead. He was 3-for-5 in the game with two RBIs. In Game Three, he homered in the first inning and drove in another run later in the game, a 4-1 Red Sox win. Derek Lowe shut out St. Louis in Game Four and the Red Sox swept the Series. It was their first World Series win in 86 years. Any number of Red Sox players might have been voted MVP, but Ramirez (1-for-4 in Game Four, without either an RBI or run scored) got the nod, perhaps in recognition of his having had at least one base hit in every one of the 14 playoff games in which the Red Sox had played. Ramirez may have seemed oblivious at times, or just downright goofy, but there were perhaps two unexpected aspects to the approach he took to hitting. First of all, the way he slipped into a kind of zen mode helped to create an almost preternatural focus, slowing down time and allowing all that he had learned to be brought to the fore. He could tune out distractions. Simply put, in the words of Jim Thome, "He's good at not letting things get to him. "17 He was perhaps like the "absent-minded professor, whose mind is so specialized and consumed by his craft that he is as helpless as a lamb outside the lab. "18 There was also craftiness in the way he would try to set up pitchers. Allard Baird reportedly told columnist Joe Posnanski that he believed "Manny will swing and miss at a pitch in April so that the pitcher will throw him the same pitch in September. "19 Alex Rodriguez told the New York Times, "When it comes to his craft, his art, his skill, he's as smart as anyone in the American League. And he takes it as seriously as anyone in the game. "20 If he was a savant, he was a studious savant. That doesn't mean he wasn't also a little flaky and a little naïve. Ramirez never once hit over .300 in 2005, and was as low as .224 more than a quarter of the way through the season (on May 27, after game number 47). One month later, on June 26, he was leading the American League in RBIs (with 66) and he finished the season with career highs in homers (45, matching his 1998 season in Cleveland) and drove in 144 runs, just four behind the league leader, David Ortiz. This was the season when Manny stepped inside the Green Monster during a conference on the mound and didn't come out until after the first pitch after play resumed. He was also marching to his own drummer, when he insisted on taking a scheduled day off despite teammate Trot Nixon having suffered an oblique strain in late July. There was tension in the Red Sox clubhouse, which had a player apparently unwilling to set his personal wishes aside to help out his team in a pennant race. There was a stronger sense of him quitting on the team in 2006, when he reported himself unable to play because of patellar tendinitis and he missed 22 games from late August into September. He still drove in 102 runs but the Red Sox failed to make the postseason (they'd gotten into the ALDS in 2005, but were swept in three games, Ramirez hitting .300). In 2007 the Red Sox won the World Series again. Ramirez started slow, got hot for a stretch, and then suffered his own oblique strain. His power numbers were down on the year, with only 20 homers and 88 RBIs (the first time he'd been below 100 in a decade, since 1997), but come the playoffs, he contributed. In Game Two of the Division Series, when Angels manager Mike Scioscia had Ortiz walked to get to Ramirez with two outs in the bottom of the ninth, it may have triggered something in Ramirez — he hit a walkoff three-run homer. His fourth-inning homer in Game Three was literally the game-winner, giving Boston a 2-1 edge in a game they won, 9-1. In the 2007 ALCS, Ramirez was facing his former team, the Indians. He drove in 10 runs, with two more homers and a .409 average. The Red Sox swept the Rockies in the World Series; he hit .250 and drove in two runs, but all in all, he was .348 with 16 RBIs in the 14 postseason games. The last guaranteed year of Ramirez’s Red Sox contract was 2008. It was the year he joined the 500-HR club, homering off Chad Bradford in Baltimore on May 31. June was a tough month for Manny's reputation in Boston. First he got into a fight with Kevin Youkilis in the Red Sox dugout during a game. Then, on June 28, he got in an argument over complimentary tickets with traveling secretary Jack McCormick and shoved the 64-year-old man to the ground.21 There were a couple of game-play situations where Ramirez seemed not to be giving his all. There were thoughts he was provoking the team into trading him. On July 31, at the trading deadline, two deals were done: Ramirez's contract was transferred to the Los Angeles Dodgers, who agreed to pick up the money remaining on his contract (the Red Sox freed him from the two option years), and Boston acquired left fielder Jason Bay from Pittsburgh to take his place. If he'd been dogging it, it wasn't entirely self-evident; Ramirez had hit .347 during July. But he'd worn out his welcome in Boston. Once he hit Los Angeles, he became an instant sensation and he reveled in the "Mannywood" moniker given him. In 53 games, he drove in 53 runs, and he hit for a .396 average. The Dodgers won the NLDS (Manny hit .500 with two homers), but lost the NLCS in five games (Manny hit two more homers and drove in seven runs, batting .533). After the 2011 season was over, however, Ramirez struck a deal under which he would accept a 50-game suspension and be permitted to return. He signed with the Oakland Athletics for 2012. He played in 17 games, batting .302 without a home run, for Oakland's Triple-A club in Sacramento, but never played for Oakland itself. The Athletics released him in June. The Texas Rangers signed Ramirez to a minor-league deal in July 2013, but six weeks later, after he hit .259 for Triple-A Round Rock in 30 games, they released him. Near the end of May 2014, Ramirez signed with the Chicago Cubs and he was again asked to play in Triple-A, this time for the Iowa Cubs as a player/coach. He claimed he was a new man, that he and his wife, Juliana, had been in church for almost four years. "Now, I realize that I behaved bad in Boston," he said. The Boston Globe's Christopher L. Gasper wrote, "Manny being Manny means something entirely different now if you are to believe Ramirez, who will turn 42 on Friday. Chastened by time, the diminishing of his skills, and his newfound faith, he has finally found a manager he likes — God. "25 Of course, time will tell. The Cubs’ president of baseball operations, Theo Epstein, hoped he would become a mentor for Cubs prospects. He played in 24 games and hit .222 with three home runs. 1 The 2009 drug was human chorionic gonadotropin, a fertility drug for women. See New York Times, May 10, 2009. 2 The best source for much more information about Manny Ramirez and the primary source for this biography is Jean Rhodes and Shawn Boburg, Becoming Manny: Inside the Life of Baseball's Most Enigmatic Slugger (New York: Scribner, 2009). The quotation noted here is from page 3. 3 Rhodes and Boburg, 5. 4 The "Ramirez family settled in one of New York City's most dangerous and drug-infested neighborhoods (between 1987 and 1991 there were 462 homicides, 58 percent of them drug-related, in Washington Heights' police precinct)." Rhodes and Boburg, 49. 5 Rhodes and Boburg, 9, 10. 6 Sara Rimer, New York Times, April 26, 2011. Rimer's lengthy profile of Ramirez, someone she had met and observed since his high school years is recommended to readers. 7 Rhodes and Boburg, 84, 85, 96. 8 Rhodes and Boburg, 111, 118. 9 Rhodes and Boburg, 147. 10 Rhodes and Boburg, 152, 153. 11 Rimer, New York Times. 12 New York Times, December 12, 2000. 13 Rhodes and Boburg, 193. 14 Rhodes and Boburg, 128, 143. 15 Boston Globe, May 12, 2004. 16 Author interview with Billy Broadbent on June 28, 2013. 17 New York Times, July 22, 1999. 18 Rhodes and Boburg, 290. 19 Rhodes and Boburg, 292. 20 New York Times, April 17, 2008. 21 It wasn't the first time Ramirez had struck a team employee. In 1998 he slapped Cleveland clubhouse assistant Tom Foster. See New York Times, March 30, 1998. 22 For a full report on the suspension, see the May 8, 2009, New York Times. 23 New York Times, April 9, 2011. 24 espn.go.com/mlb/story/_/id/9403816/manny-ramirez-parts-ways-eda-rhinos-taiwan-league. Posted June 20, 2013. 25 Boston Globe, May 29, 2014.